Renown in culinary circles the world over, the Dungeness crabs is named for the Dungeness Valley right here on the North Olympic Peninsula. What better way to honor our delicious local crab than to eat a LOT of it? The festival begins a 4:00 p.m. Friday with the Community Crab Feed. Come to the big tent and dig in! You’ll get $5 off fresh crab dinners and there will also be wine, beer, coffee, desserts and live music. Throughout Saturday and Sunday, the Crab Fest cooking demos will give you a chance to learn how to make some great seafood recipes. This year’s special guest chefs are Becky Selengut, the author of Good Fish, and Garret Schack, Executive Chef of Vista 18 in Victoria, B.C. They and Olympic Peninsula chefs will show you how it’s done, including how to correctly clean and cook a whole crab. When you come to downtown Port Angeles, you can’t miss the big tent. That’s where to go to get a big plate of freshly cooked delicious seafood. And just outside, the main stage will keep the live music going all weekend long. On City Pier, more than 50 craft, merchant and food vendor booths will be set up for you to shop, eat (more!) and peruse. City Pier is also the place to go for the fun and daring of the the grab-a-crab tank derby. The Feiro Marine Life Center is right there, too. Kids and adults enjoy the exhibits, especially the touch tank with live sea creatures. Both Saturday and Sunday at 2 p.m. everyone like to get a good spot on the pier and its tower to see the exciting U.S. Coast Guard air-sea rescue demonstration. For those with a slight competitive streak, there’s a Hollywood Beach volleyball tournament Saturday and Sunday and a 5K fun run on Saturday. Sunday’s Crab Revival and Sunday Brunch serves up a fine breakfast menu from 9-10:30 a.m. and there’s a non-denominational service with live gospel music. 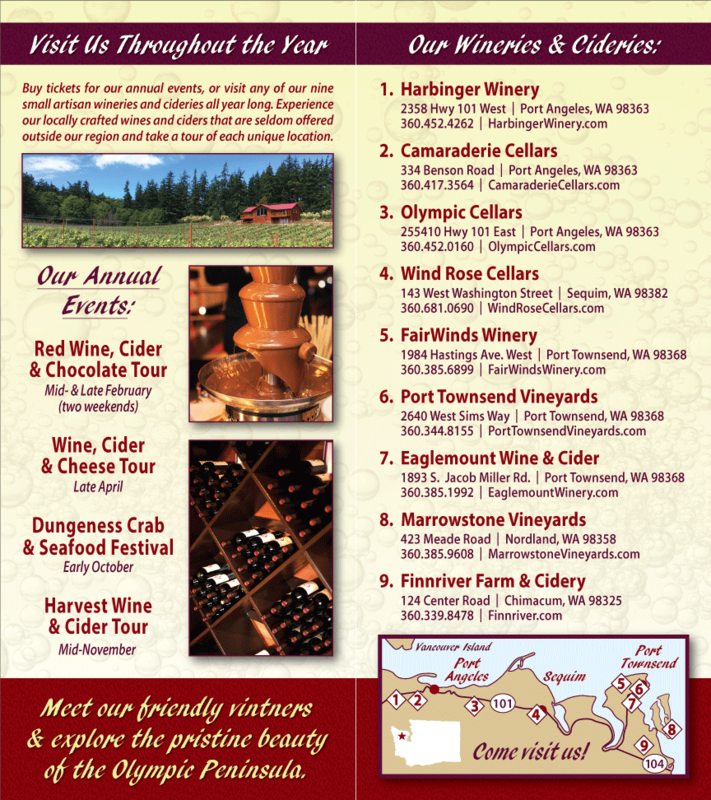 Olympic Peninsula Wineries are proud to be a major sponsor of this annual event celebrating our fresh local seafood. Be sure to stop by the Crab Festival Wine & Beer Garden to taste wines from all eight wineries.